We’ve learnt one important thing about new Relationship Manager, Thomas, this week. He’s very good at keeping secrets. Something you may not know about Thomas is that he’s heavily involved with Radio, presenting shows including ‘I Believe I had a Hat’, ‘Don’t You Want Me Eighties’ and ‘The 50 Hour Rebellion’ – he’s also the Head of Radio (casual!) 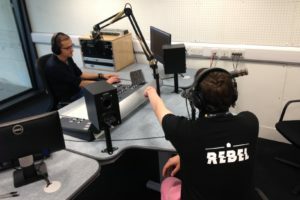 at Rebel, the radio station at Essex University, and has won multiple awards (he’s most recently been nominated at the Student Radio Awards 2017, for Best Sports Programming for ‘Derby Day’ in which he was the lead anchor) – we told you he was heavily involved! 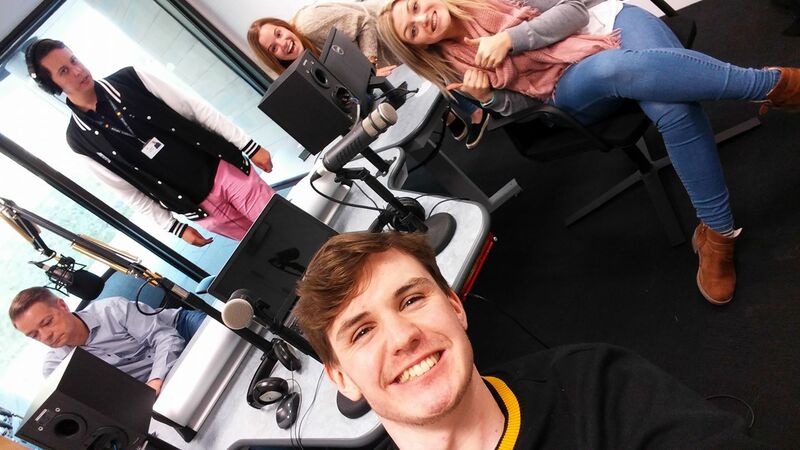 As per usual, Tom B kept us in the dark as to what the sixth Apprentice Challenge would be – all that we knew was it would be at Essex University, it would take most of the day, and we didn’t need to wear walking boots (which was a relief). Thomas; however, was very aware – as they’d been sneakily planning the day since August! 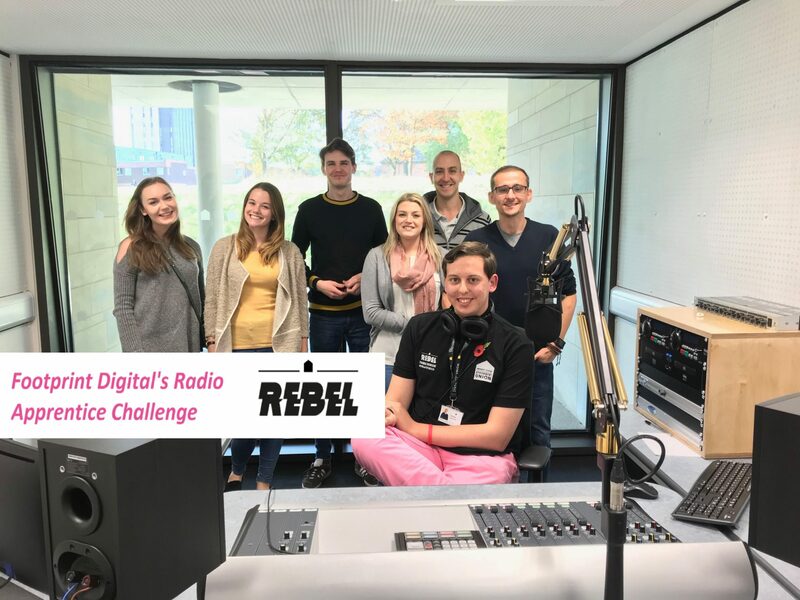 When we arrived – coffees, hot chocolates, and bacon-and-cheese-pastries in hand (if you ever go to Essex Uni, get one of those things) – we were told that we’d be taking over the studio at Rebel to make rival radio adverts! Before we got started, Thomas showed us some examples of great adverts from the past. For example, Kodak’s Symphony of Colours which made you hear colours through different pieces of music and British Airways, who merged Sitar playing with classical music to demonstrate that the world is closer than we think. The Sunbears would have a 50-minute slot to record at 1pm, followed directly by the Hungry Hungry Hippos at 2pm. Results of the winning team would be announced at 3.30pm – the heat was on and we only had a couple of hours to come up with a concept, create a script, rehearse and then record and produce our adverts! The Hippos took over a working ‘pod’ near the radio station, got overly excited about the fact that you could write on the walls, and then got down to business. They focused on what Footprint Digital wanted from the advert (to highlight our values, our expertise, and the fact that we really care and make thing simple), who our target market is (SMEs who are driven, ambitious, and want to grow) and what they would want to hear. After a lot of discussion, we hit upon an idea – to play on the fears and anxieties that we know a lot of our clients have, and then show how Footprint can help. A lot of our clients are worried about technical jargon, and don’t have the time to deal with the technical side of digital marketing. Some have even had bad experiences with SEO before, so all in all, it’s been a bit of a nightmare for them. The Hippos’ advert started with a nightmare scenario, where digital marketing is seen as a scary and confusing thing, but this switched into a fun and happy advert showing that with Footprint Digital, it doesn’t have to be scary. 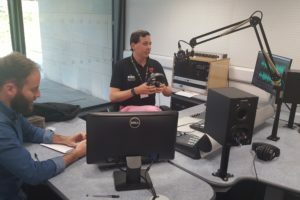 Before we got into the studio we had a crisis moment where the team were doubting the concept (we threw around a few new ideas but with only twenty minutes left before our slot, we couldn’t really back out!) That was our own nightmare, but once we were recording we realised that the idea was a good one! Tom J gave an excellent vocal performance recording the first half of the advert, as well as producing under Thomas’ well trained eye. The Sunbears’ advert concept was completely different, as they focused on the story of a new digital marketing manager catching up with a friend in a coffee shop (expertly played by Relationship Managers, Hannah and Caroline). The marketing manager is frantic, with far too much work to do and in need of a few extra days in the week to get it all done. Luckily, her friend offers a stellar piece of advice -to call the team at Footprint Digital! After a quick sandwich in the SU (not as good as the bacon-and-cheese-pastry), we headed back to find out the results and see who had won that all important point! Thomas and Tom B were judging us on different sets of criteria. Tom B oversaw judging us on: Clarity of Message; On Brand-ness; Call to Action; Entertainment Value. Thomas judged us on: Production; Creativity; Suitability for Medium; Time Management; and Overallness (was it a good radio advert overall). There was only one point in it! The Hungry Hungry Hippos once again pipped the Sunbears to the post, gaining that all important point before the Finale of this year’s Apprentice Challenge. Currently, the score is 5-3 to the Hungry Hungry Hippos, but we’ve been told that the final apprentice challenge will give the Sunbears a chance to make a comeback, so nobody’s getting complacent – it’s all to play for! We really took the team out of their comfort zone with this challenge. 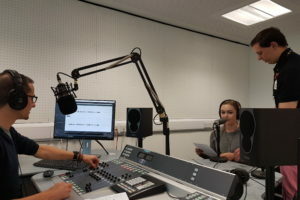 Radio is a lot of fun and very exciting, but can be quite nerve-wracking the first time you do it. It’s a true test of character, and I think everyone passed that test with flying colours. 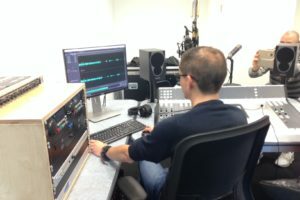 They had such a short period of time to learn what they were doing, how to make a radio advert, and to create their ideas and scripts, before recording the thing and doing the various post-production elements that are essential to high quality radio. The team had to do every element themselves, with a little guidance. I was incredibly impressed with the way everyone went about it. The Sunbears had a lot of content in their advert – probably a little too much, as it meant they had to say everything quite quickly and that lost some of the clarity. They could have done with a little more time for post-production, using a lot of their short studio time to rerecord the lines several times which left them a little short. The Hungry Hungry Hippos had an impressive production level and their advert was more creative. That said, it did have quite a few radio clichés in it which we would ideally like to avoid, such as the record scratch and the evil voice. It was, however, very entertaining. closing remarks and call to action all the more powerful. I can’t deny, though, that The Hungry Hungry Hippos deserved the win, although it was rightly very close. For me, I was amazed by everyone, as they really threw themselves into it and created some really great content. 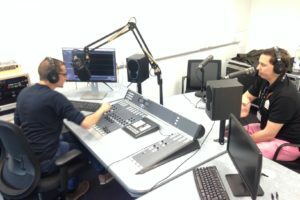 We’ve often said that a few of us have faces for radio, and now we know that some have the voices to go with the medium too. It was a great experience for me to share some of my knowledge with the team. I hope they got a taste of what makes radio the most wonderful thing in the world, and why it is my greatest passion.